I am craving s'macos so hard. I haven't had one in years, but someone said the word marshmallow to me this morning, and really that's all it takes. I mean seriously, check my handle. What are s'macos you may ask? Brace yourself. Here is, verbatim, my entry from a cookbook I wrote several years ago about summer camp. You're welcome. Prepare yourselves, my friends, for the wave of mexican-summer camp fusion food sweeping the nation. I am about to reveal to you my patented* recipe for s'macos, the best thing to happen to campfires since matches. When I die, I want my lifelong contributions to the gospel of s'maco to be mentioned in my obituary**. What is a s'maco, you ask? A s'maco is like a s'more and taco combined. Actually, it's like a s'more and a burrito combined, but no one thinks "s'morrito" is a catchy name. Simply fill a flour tortilla with chocolate chips and mini-marshmallows, wrap tightly like a burrito (see above), encase in aluminum foil (or "s'maluminum" if you're really getting carried away with the spirit of it), and chuck it in the fire. 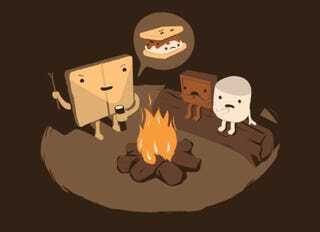 Learning when your s'maco is properly cooked is a matter of judgement and experience. I find two minutes just about does the trick. Does it have to be cooked in the fire? Nope. They can be cooked them in an oven, in a frying pan, in a pink George Foreman grill, in a pair of boots left in the sun….really whatever works best for you. Use white chocolate chips and handmade tortillas for that touch of class. Add some sweet pineapple or macadamia nuts to give your smacos a little tropical flare. Skippy S'macos:Made with peanut butter. My friend Kristin invented this variation, because she is awesome.What? You want a shout out now? Then stop being lazy and invent me an awesome s'maco variation. Can't get enough marshmallows and mexican food? Try pouring some chocolate syrup over it and calling it a smenchilada. Grab some graham cracker squares and make some smachos. Mix marshmallow fluff, chocolate icecream, and tequila in a blender for a s'morgarita***. Hola sugar coma! ** That might be true. ****But if you do, send me a picture and tell me how it goes!